Gov. 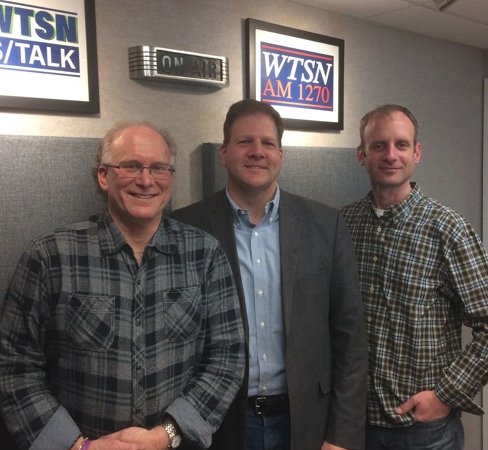 Chris Sununu is pictured at WTSN studio where he spoke to Mike Pomp on Friday about a number of issues, including Northern Pass. Sign for free weekly newsletter here. Read all of InDepthNH.org’s Northern Pass’ coverage here. “So the ball is on the five-yard line and the referee stepped in and said ‘game over. We’re not even going to listen to anything else.’ That’s not right,” Sununu said speaking to Mike Pomp on NewsTalk 98.1 WTSN. As a non-lawyer, Sununu said he didn’t know whether it was legal. But the decision came in too fast and never gave Eversource Energy/Northern Pass a chance to negotiate, he said. “They couldn’t be more wrong. This was clearly a pre-staged decision, I think,” Sununu said. Members of the Site Evaluation Committee deliberated on Northern Pass on Jan. 30 and voted it down on Feb. 1. He said the SEC shortcut the process. Five of the seven members of the SEC represent state agencies and two are members of the public. The members include Chairman Martin Honigberg, PUC, presiding officer; Commissioner Kathryn Bailey, PUC; Dir. Craig Wright, Department of Environmental Services; Christopher Way, Department of Business and Economic Affairs; William Oldenburg, Department of Transportation; Patricia Weathersby, public member; and Rachel Dandeneau, alternate public member. A decision wasn’t expected for a few more weeks, Sununu said. “They were railroaded,” Sununu said of the project. Sununu went on to say the project would have lowered electric rates, would not interfere with tourism and would have benefited towns like Berlin and Franklin. One mother called him crying because she believed Northern Pass investment would have transformed her school system, he said. The group’s spokesman Jack Savage said: “Based on his comments, the governor seems to understand that the SEC’s decision was legal, that Northern Pass as proposed is done, and that other projects are ready alternatives. “It’s too bad he apparently hasn’t listened carefully to the communities and thousands of people who oppose Northern Pass to better understand why this project is wrong for New Hampshire, and why the SEC decision was right,” Savage said. Although Sununu said Northern Pass is a huge loss for New Hampshire and “it doesn’t look like it’s going to happen,” project spokesman Martin Murray said he remains hopeful. “We will soon file a motion for reconsideration with the New Hampshire Site Evaluation Committee,” Murray said. A spokesman for the Mass. Department of Energy Resources (DOER) said there was a meeting with the electric distribution companies Eversource, National Grid and Unitil on Friday morning with the independent evaluator, to discuss the implications of the SEC vote. The Massachusetts selection of Northern Pass out of 46 bidders to negotiate a contract for the Mass. clean energy project, is under scrutiny because the three major utilities helped select the winning bid. An email from the Mass. Department of Energy Resources said more information would be forthcoming on Feb. 16. Sununu said he wants change. “When you look at that process, that just screams that something’s wrong and as governor, I’m going to do what I can to fix it,” Sununu said. He didn’t specify how. He didn’t say, and Sununu hasn’t responded to requests for comment from InDepthNH.org, whether they involve the National Grid project New Hampshire lawmakers are pushing. A group of lawmakers has asked Sununu to back National Grid’s Granite State Power Link. At the Feb. 1 deliberative session, the SEC said members couldn’t approve the application based on the issue of whther it would impact orderly development. The committee had already agreed Eversource would have the funds to build the project, but didn’t discuss the last two before voting it downs.